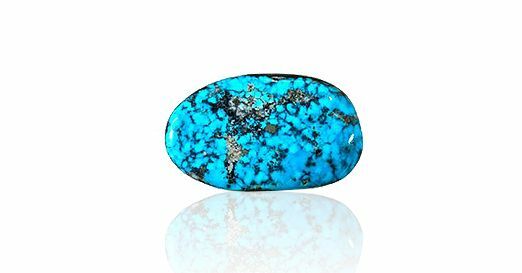 Turquoise might lack the sparkle and clarity of transparent colored gemstones like ruby, emerald, and sapphire, but its multi-layered history and soul-satisfying color make it a desirable gem. Its color can range from dull greens to grass greens to a bright, medium-toned, sky blue. People value turquoise highly for its combination of ancient heritage and unforgettable color. The traditional source for the top color, sometimes described as robin's-egg blue or sky blue, is the Nishapur district of Iran, the country formerly known as Persia. So, quite often, you'll hear people in the trade call turquoise of this beautiful color "Persian blue," whether or not it was actually mined in Iran. Although much turquoise jewelry is sleek and modern, many US consumers are familiar with the traditional jewelry of Native American peoples such as the Pueblo, Hopi, Zuni, and Navajo. People interested in Native American arts and crafts frequently collect this stylized silver jewelry. Turquoise deposits usually form in iron-rich limonite or sandstone. Limonite creates dark brown markings in turquoise, while sandstone creates tan markings. These markings are remnants of the host rock within the turquoise, and can resemble splotches or veins. They're called matrix. The presence of matrix can lower the value of turquoise, but that doesn't mean turquoise with matrix is worthless or unmarketable. Some buyers actually prefer the presence of matrix in fashioned turquoise if its effect is attractive and balanced. This is especially true if it's a type of turquoise known in the trade as spiderweb turquoise. It contains matrix in thin, delicate, web-like patterns across the face of the gemstone. The patterns provide a dark contrast to the gem's bright blue. Turquoise is found in only a few places on earth: dry and barren regions where acidic, copper-rich groundwater seeps downward and reacts with minerals that contain phosphorus and aluminum. The result of this sedimentary process is a porous, semitranslucent to opaque compound of hydrated copper and aluminum phosphate. Turquoise is one of the world's most ancient gems. Archaeological excavations revealed that the rulers of ancient Egypt adorned themselves with turquoise jewelry, and Chinese artisans were carving it more than 3,000 years ago. Turquoise is the national gem of Tibet, and has long been considered a stone that guarantees health, good fortune, and protection from evil. The gem's name comes from the French expression pierre tourques, or "Turkish stone." The name, which originated in the thirteenth century, reflects the fact that the material probably first arrived in Europe from Turkish sources. Turquoise was a ceremonial gem and a medium of exchange for Native American tribes in the southwestern US. They also used it in their jewelry and amulets. The Apaches believed that turquoise attached to a bow or firearm increased a hunter's or warrior's accuracy. Its color can range from dull greens to grass greens to a bright, medium-toned, sky blue. It's safe to clean turquoise jewelry with warm, soapy water, but it should never be cleaned with steam or ultrasonic cleaners. Some turquoise is treated to improve its surface appearance. Heat or solvents can damage the treated surfaces. This information was excerpted from GIA's Gem Encyclopedia with permission from GIA.